I’m going to be honest. I went hunting for this book. Not this particular book, but I wanted to read a book in which the plot line involved letter writing or some sort. I ordered this book for our collection, because writing–duh!, and figured I’d I should give this a shot. I didn’t realize it was based on a true story. Plot: Caitlin’s class participates in a pen pal exchange program with students from several different countries. She ends up choosing Zimbabwe. Meanwhile, in Zimbabwe, Martin’s part of what I think of as the honor roll group. He has high marks and because of this, he gets to receive a letter through a pen pal exchange program which is Caitlin. Over several years, these two exchange letters. Martin comes from poverty and his family struggles to put food on the table and keep the roof over their heads and keeps this from Caitlin. Caitlin writes to Martin about her day including trips to the mall and sends lots of pictures, in contrast to Martin whose father had to put their handheld stereo on collateral so they could pay the photographer to come and take two pictures. They lose their stereo. During this time, Zimbabwe goes through some political struggles and that’s when Caitlin finds out what really is going on with Martin which drives her to action. Review: I enjoyed this book. I really did. And not just because I’m a letter-writing geek who gets super excited when I receive letters. In its simplicity through narrative and snippets of their letters, it tells the story of how friendship can develop even though you’re on separate continents. And I miss that human connection in a world where likes and one line comments are the main form of communication. Don’t get me wrong. I love that I can virtually connect with people across the global through social media. I absolutely love it. But how many times have you had these exchanges through your computer only to find that when you see one of your “friends” in real life, say at the super market, all you do is wave to each other? It’s hard to move that relationship offline sometimes and I get that. Some reason, I don’t think that applies to letter-writing. Something happens when you receive a physical letter. Anyway, way off topic. Sorry, let me bring it back. Because the plot is based on actual events, there’s not much to comment on in way of creativity. The narrative and they way the story was told, however, was done nicely. The narrative went back and forth between Caitlin and Martin and snippets of their letters were dropped in throughout the story. I loved that it ends … well. I’m not one to get defensive about spoilers, but I know others are. I love the way the story starts, progresses, and ends. That said, it was a quick read. I read it in one sitting. The story moves fast and there’s really no slowing down once you get started. I have to say, though, it may bore some readers because of it’s simplicity and maybe a little bit predictable. 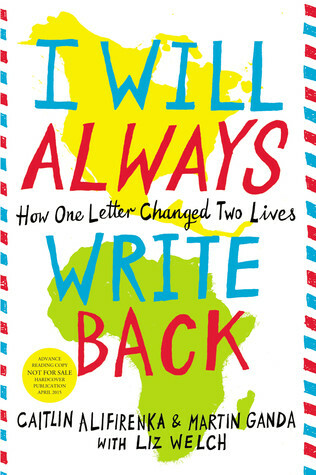 However, it was a fun read and met my requirements in finding a book with letter-writing. I’d recommend this to anyone who’s looking for a light read and looking for a feel-good-pick-me-up kind of story.